Lipogramme klayi, is a rare deepwater bi-color basslet found in Curacao. At first look, this beautiful species may resemble the common royal gramma. The Lipogramme klayi however, is extremely rare, and is only found in depths of over 200 feet. In contrast with the deeper purple face of the Royal Garmma, the Lipogramme klayi has a vibrant magenta colored face, with scattered spots continuing along it’s delicate body, like a gradient. 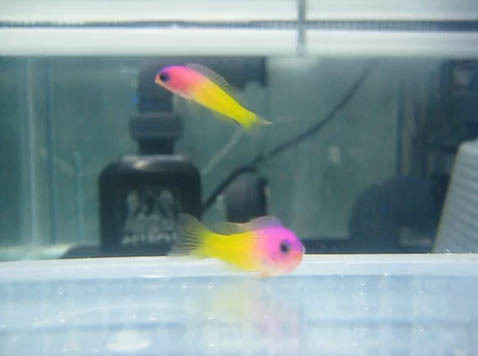 This video, depicts a Lipogramme klayi pair at Reborn Aquarium in Singapore. As with many deepwater fish, these beauties will cost you a pretty penny, between $1000-$2000 a piece.